Morality and ethics. These words hang like a challenge to intellectual-only faith that likes to keep its hard clean and dry. “B&H Studies in Christian Ethics” is a series bent towards fixing that. In Taking Christian Moral Thought Seriously (henceforth, Christian Moral Thought), a collection of philosophers address some of the most pertinent ethical issues of the day. Edited by Jeremey Evans, Christian Moral Thought consists of multiple essays that push the borders and ingrained thinking of conservative ethical thought. The essays in Christian Moral Thought are straight forward presentations. A dry, straight forward, yet highly effective presentation/lecture style is maintained in almost all of the essays in both introducing concepts and communicating important points. These essays are written in an effective manner distributed in highly technical language. The praised exception, John Ross Churchill’s “Two Dialogues on the Philosophy of Science” (chapter 4) provides the only non-presentation style essay. The many authors of Christian Moral Thought are effective in getting to their points, at the cost of difficult reading for casual readers. James Noland’s essays “A Critique of Public Reason” (chapter 1) and “Reframing the Abortion Question” (chapter 5) are worth the price of Christian Moral Thought on their own. Noland’s criticism of enlightenment thought and its subsequent individualism present multiple applications for the church in ethics. In his critique of enlightenment principles Noland states, “When Christians try to argue for the truth of Christianity or for the truth of any of its specific moral teaching on the basis of ‘reason alone’…we implicitly present Christian truth as but an instance of some large universal truth” (20). In a similar way, his essay on abortion and its critical undermining of worldly individualism is the most praise worthy chapter of the entire volume. Far from undermining a Christian ethic, Noland repeatedly reveals the world’s influence in Christian thought. Kent Dunnington’s essay (chapter 2) presents some phenomenal questions for education by the state. His concluding thoughts on moral instruction and the church’s prerogative in education its youth (40-46) are a much needed challenge to a lethargic statist Christianity. Dunnington, like many authors in this volume, lacks a strong theological conviction but in some ways this adds to the validity of his arguments. Even philosophically the state educating its members does not make sense. With only seven essays in Christian Moral Thought, John DePoe’s (chapter 3) stands out in a negative way. While DePoe provides valuable criticism of worldly answers for disagreement over religion and epistemology (52-65), his general enlightenment paradigm (72, footnote 38) is not ground breaking or decisive. It also leads him to a lackluster treatment of Reformed Epistemology which does attempt to highlight the grace of God’s revelation as the source of epistemology. Though Alvin Plantinga, and Reformed Epistemology, gets a more polite nod in Churchill’s dialogues/essay (81), the paradigm of DePoe is strikingly different than the other authors. David Graham Henderson’s essay on “Creation Care” (chapter 7) stands out as the most theologically grounded writing. As all the authors have degrees in philosophy it is not surprising that there is a lack of Scriptural arguments. Henderson’s arguments for Christian concern for creation take a deep look at the creation account and the Biblical language used to describe man and creation. Relying on the theological working of other men, Henderson provides a resoundingly strong call to the church to concern itself with ecological ethics. 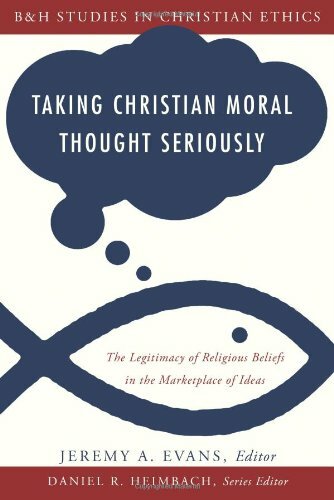 In conclusion, Taking Christian Moral Thought Seriously is one of the most important introductory books on practical ethics that can be read by conservative laymen and pastors. This book’s niche is Southern Baptists but it expands beyond many traditional boxes in exceptional ways. Its essay style makes it accessible to seminary instruction, Bible studies and straight through individual reading.